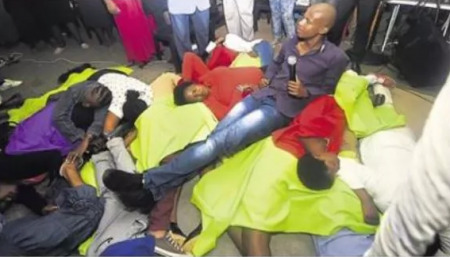 An end time church pastor has allegedly shocked his members by encouraging them to climax in church as he believes they will produce a sacrosanct fluid to make the church floor as sacred as heaven. The news was reported by Zambian news agency Mwebantu Breaking News. MBN wrote: "Charismatic preacher in South Africa has shocked the world after he asked his members to undress in church until they reach climax. According to the pastor, the holy fluid of sperm would produce a sacrosanct fluid which would make the church floor as sacred as heaven. Church members both males and females were head screaming in excitement as they reach climax in church. Some fell in deep sleep after the act."